Think of your novel in terms of scenes (sections that contain a single important plot event or character interaction) or larger units (such as acts, as She’s Novel does in their post on pace and storytelling). These larger units typically have distinct degrees of pace. For example, in the basic ‘three act structure’ borrowed from theatre, there is an opening, middle and end to the story. Typically, the first act introduces readers to the central conflict that your story will resolve. This could be anything from an inexplicable disappearance (such as the disappearance of a cat in Haruki Murakami’s The Wind-up Bird Chronicle) to a character’s inner conflict about themselves. The middle act of your novel is where you develop this central conflict and help the reader understand its origins and the direction it might lead your character(s). The final act brings the conflict to a head and (usually) resolves it. 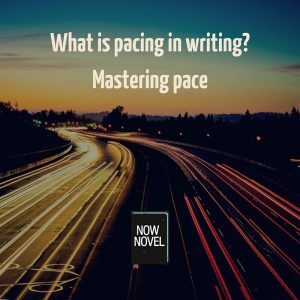 Each of these sections of your novel will have different pacing. The first act usually doesn’t dawdle and take its time, as you want the reader to be lured in. The middle act is where you can push and pull pacing more. If in the first act your protagonist (main character) is struggling with a desire to kill, the middle act can show him slowly giving in to (or overcoming) this urge. There can be moments of calm and moments of high tension. In the third act, though, the pace usually increases as tension builds. The cracks have started to show in your main character’s personal life – he can no longer keep his bad deeds a secret. The stakes increase and the reader wants to know how it will all end. To make the pace move at the correct speed in each of these larger structural units, think about the purpose of the section. If you want to grip the reader, use conflicts and move your characters from setting to setting to create a sense of momentum. 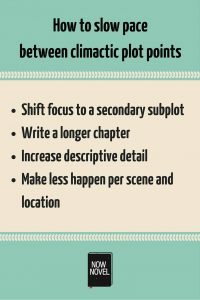 Similarly, if you want to give the reader some respite before the major climax, you can slow your story pacing and lessen the conflict and tension for a while. 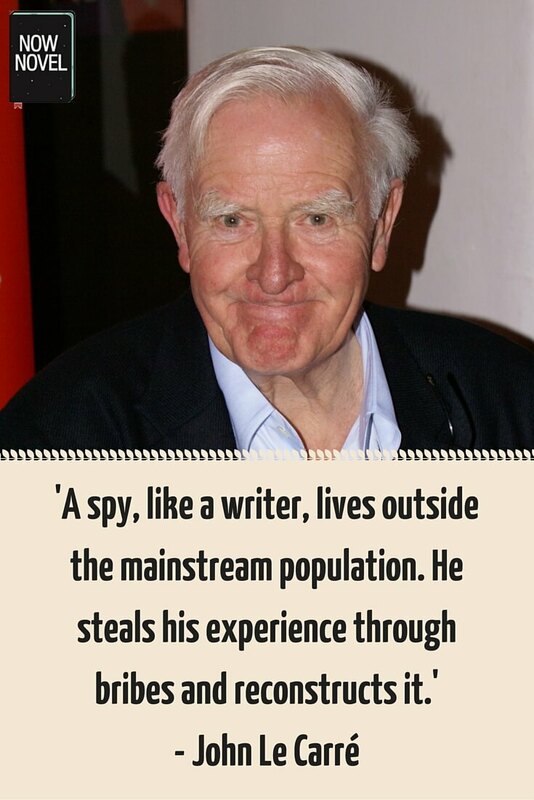 Even if thrillers and spy novels aren’t your preferred genre, read bestsellers who have mastered pacing such as John Le Carré. 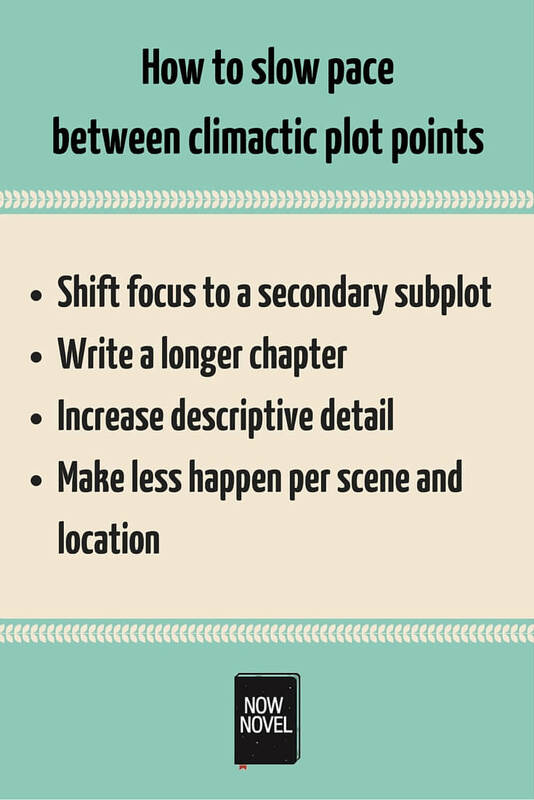 This will help you to understand how to make your plot ebb and flow engrossingly. 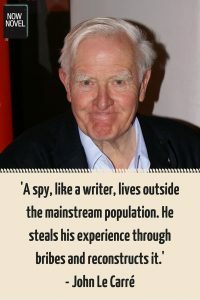 Even though most of Le Carré’s protagonists are embroiled in internal rather than external conflicts, the writer masterfully unfolds these struggles at a pace that isn’t leisurely but also isn’t mechanically hurried. The abandoned-looking building stood foreboding in the dusk and we snuck around the side, minding the cameras that swivelled out front. I froze when I heard a man’s voice through a plastered-over window. ‘We need to find new headquarters,’ he hissed. The building looked abandoned. Foreboding. Cameras swiveled out front so we decided to sneak around the side. Suddenly a man’s voice hissed through a covered window. ‘We need to find new headquarters’. The second keeps the pace moving, not getting lost in lengthy sentences and detailed descriptions. Of course, you could also keep your writing descriptive until the conversation starts and then alter the pace, to create sudden tension. These are the choices you will need to make regarding sentence structure: Where will the story start to move? Where will characters sit back and admire the scenery? A great novel has balance: Some scenes hurtle along while others dawdle and meander. Some genres have more of the hurtling (such as thrillers) while others more of the dawdling (many character-driven dramas and romances). 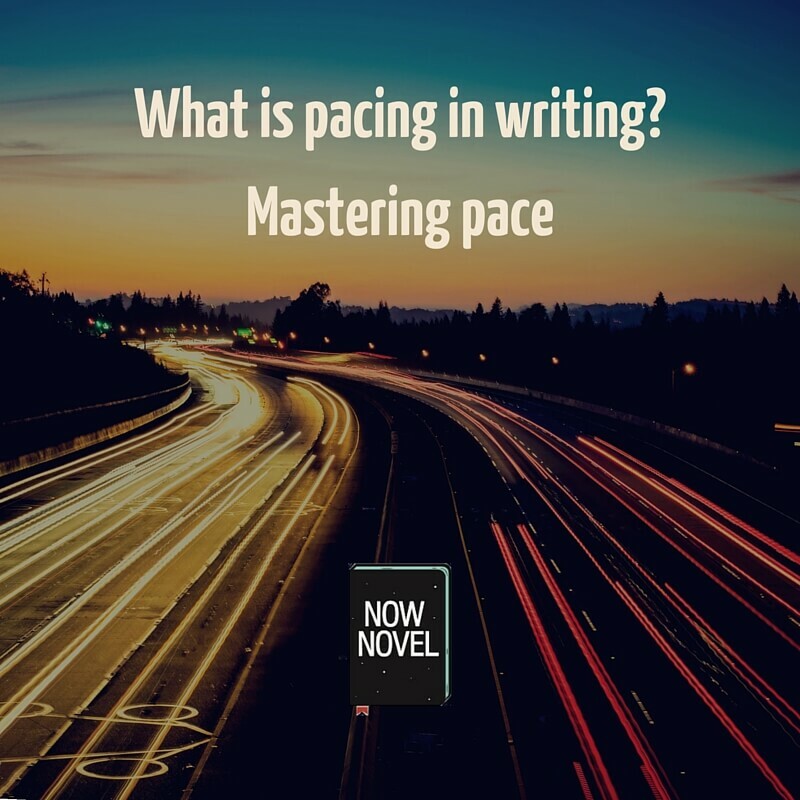 Whatever type of novel you’re working on, getting pacing in writing right will keep readers entertained and committed to finishing your book. Start working out the details of your plot now using Now Novel’s step-by-step book-writing process.